Brother/Sisters : Three sisters Bibi Updesh Kaur, Bibi Sukhwinder Kaur and Bibi Harwinder Kaur. A tribute to amar shaheed bhai gurdev singh ji usmanwala. member of the 5 member panthic committee which was launched at the sarbat khalsa in 1986. bhai sahib was a member of this official committee alongside shaheed bhai aroor singh ji and shaheed baba gurbachan singh ji manochahal. Panthic Committee member, Shaheed Bhai Gurdev Singh Usmanwala was born on 23rd July 1958 in the house of army constable, Sardar Jarnail Singh and from the womb of Mata Parsin Kaur in Quarter Jhansi, Haryana where Sardar Jarnail Singh did his army service. Sardar Jarnail Singh recited his Nitnem daily and Mata Parsin Kaur also had been reciting the Panj Granthi Nitnem daily. The parents passed love and Sikhi into Bhai Sahib from birth. After Sardar Jarnail Singh finished his army service, the whole family moved to the village of Usmanwala, district Ferozpur. Bhai Sahib had three sisters Bibi Updesh Kaur, Bibi Sukhwinder Kaur and Bibi Harwinder Kaur. When the Jathedar of Dam Dami Taksal, Sant Kartar Singh Ji Bhindranwale came to Harihar Jhok to do katha and kirtan smagam in 1966, Mata Parsin Kaur bought her son, Bhai Sahib to this smagam also to be given Amrit by the Panj Pyare. On the same day Jathedar Jagir Singh of Mohre Wala village also bought his son, Bhai Mokham Singh to be given Amrit. When Sant Kartar Singh Ji Bhindranwale saw the two young boys, who roughly 8 years old playing with each other in orange turbans and white Kacheras, at that time Sant Ji told his fellow singhs, “These two boys will do big sewa for the Sikh faith when they grow up”. Sant Kartar Singh Ji Bhindranwale requested Mata Parsin Kaur and Jathedar Jagir Singh to allow their sons to be taught Sikhi at Dam Dami Taksal headquarters, Gurudwara Gurdarshan Parkash, Chownk Mehta. Both set of parents did not refuse Sant Kartar Singh Ji Bhindranwale and agreed to send their sons to Chownk Mehta. In 1968, Sant Kartar Singh Ji Bhindranwale came to the village of Usmanwala along with his Jatha to take Bhai Sahib with him to Chownk Mehta and the same was done with Bhai Mokham Singh also. Both singhs received Gurbani Santhaya from Dam Dami Taksal. After Gurbani Santhaya Sant Kartar Singh Ji Bhindranwale sent Bhai Sahib home to Usmanwala to complete his school education. Bhai Sahib studied at the local government school up until 8th class. “One night all singhs were sleeping, I and Sant Jarnail Singh Ji Bhindranwale were in one room. Soon I would fall asleep but Sant Jarnail Singh Ji Bhindranwale continued to do Waheguru simran all through the night, he would also do 110 Jap Ji Sahibs daily. That night he went into deep meditation and had tears in his eyes, Sant Jarnail Singh Ji Bhindranwale had darshan of Mata Sahib Kaur, she asked him, “Yes my son, Jarnail Singh, why have you got tears in your eyes, you’re always making humble requests?” Then Sant Jarnail Singh Ji Bhindranwale put bowed his head down and made a humble request to Mata Sahib Kaur, “Mother, just like you have given me your darshan, please get Guru Gobind Singh Ji, my father to also give me darshan”. Then Mata Sahib Kaur went to Guru Gobind Singh Ji and said, “Sahib Ji, Jarnail Singh is asking for your darshan. He always is asking for your darshan. Please give your son darshan and fulfil his humble request. That night Sant Jarnail Singh Ji Bhindranwale received the darshan of Guru Gobind Singh Ji and the face of Sant Ji had lit up red. Sant Ji requested Guru Gobind Singh, “Guru Ji, I don’t enjoy doing the deeds of this world, please give me a place beside your feet. Guru Gobind Singh Ji said, “Son Jarnail Singh, you will become the General of the Sikh panth and will lead the movement for the Sikh freedom. You are yet to defeat the army of the enemy, the enemy will fear your name. The Sikh panth needs your leadership. Don’t worry, you will live and die with pride. You will live and die for the well-being of the Sikh panth”. As Sant Ji was receiving the darshan of Guru Gobind Singh Ji, I felt a pain in my stomach and touched Sant Ji, at that moment the darshan of Guru Gobind Singh Ji disappeared. Sant Ji was angry at that time and I left the room. Later Sant Ji hugged me and explained everything to me”. On 16th August 1977, Sant Kartar Singh Ji Bhindranwale passed away, at that time Bhai Sahib was in Usmanwala working in the family farms. As soon as Bhai Sahib received the sad news, he hurried up and reached Chownk Mehta, the headquarters of Dam Dai Taksal. After Sant Kartar Singh Ji Bhindranwale, Sant Jarnail Singh Ji Bhindranwale was made the leader of Dam Dami Taksal. Sant Jarnail Singh Ji Bhindranwale would lead Dam Dami Taksal on to new level of struggle for the Sikh freedom. Bhai Sahib was one of the 45 singhs who had elected Sant Jarnail Singh Ji Bhindranwale as the next Jathedar of Dam Dami Taksal. All these 45 singhs had given their word to protect and serve the new Jathedar of Dam Dami Taksal. When all other methods fail, it is proper to hold the sword in hand. The Singh had started to punish the killer of Sikhs, Gurbachana and his bodyguard Partapa were killed in Gurbachana’s house in Delhi. Soon Lala Jagat Narayan who wrote articles against the Sikhs was also sent to hell by the singhs to join Gurbachana. Now the anti-Sikh elements were thinking twice about their actions against the Sikhs as they could have the same fate as Gurbachana and Lala Jagat Narayan. Whenever these anti-Sikh elements saw a turbaned and bearded Sikh, their legs would start shaking. Bhai Sahib was one of the close singhs of Sant Jarnail Singh Ji Bhindranwale. Bhai Sahib would make Sikhs aware of their human rights. The Congressi leaders of village Usmanwala did not like Bhai Sahib making the locals aware of the reality of Congress and soon started complaining about Bhai Sahib to the police. Judging the bad times, Bhai Sahib started living away from home. A Congress leader of village Kamla Bondla, Balram would speak against Sant Jarnail Singh Ji Bhindranwale and encourage the Hindu population to go against the Sikhs. Bhai Sahib and Bhai Gurnam Singh Bandala of Dam Dami Taksal, knew they had to shut the mouth of Congressi Balram from spreading hatred against the Sikhs. One day when Congressi Balram got on the stage at one of his conferences, Bhai Sahib and Bhai Gurnam Singh Bandala were seated in the public in the disguise of farmers. Bhai Gurnam Singh Bandala had blanket wrapped around him and sword hidden under the blanket. Soon as Balram grabbed the microphone and talked against the Sikhs, the singhs jumped out of their seats and shouted “Bole So Nihal” and even the Sikhs within the crowd shouted, “Sat Sri Akaal”. Bhai Sahib jumped on to the stage and pushed about 2-3 people off the stage. With his left hand, Bhai Sahib grabbed Balram from behind his neck and with his right hand snatched the microphone from Balram. At this moment all of the public started running out of the tents set up for the conference. The Congressi leader, Balram had urinated in his pyjama and made the stage wet. Balram had by now made a complete fool of himself in front of the public. At this moment the police came and fired a bullet into the air in order to stop everyone from doing what they were doing. The Singhs let Balram go and allowed start living the life of shame. Bhai Sahib and Bhai Gurnam Singh Bandala was arrested by the police and taken to the Sadar police station. After pressure put on the police by the Sikh sangat, both singhs were released and straight after being released the singhs went to Sant Jarnail Singh Ji Bhindranwale. Here Sant Jarnail Singh Ji Bhindranwale greeted the singhs with hugs. The Hindu Shiv Sena yobs were causing damage to the Sikh properties and the Sikh values in Ferozpur by burning Sikh houses and business and also shouting anti-Sikh slogans. Sant Jarnail Singh Ji Bhindranwale gave the duty of challenging these Shiv Sena yobs to five Sikh warriors, Bhai Gurdev Singh Usmanwala himself, Bhai Gurjit Singh Harihar Jhok, Bhai Harbhajan Singh Mand, Bhai Gurnam Singh Bandala, Bhai Rasal Singh Arifke and Bhai Durga Singh Arifke. Now on one side there were 5 singhs with naked swords ready to do anything in order to defend Gurudwara Khalsa of Ferozpur and on the other side there were 1500 weak Hindu wannabe gangsters of Shiv Sena. The Punjab police and the Shiv Sena yobs were not able to get close to Gurudwara Khalsa. The government had to step down and move away from the Gurudwara Khalsa. Once the singhs were satisfied that no one would attack the gurudwara, they all went back to Sant Jarnail Singh Ji Bhindranwale at Sri Darbar Sahib. In the last week of May 1984, the Indian security forces, such as the army, CRPF and BSF were deployed to surround Si Harimandir Sahib complex. As soon as June started the prime minister of India, Indira Gandhi gave the control of Punjab to the Indian army. Sant Jarnail Singh Ji Bhindranwale knew that the Indian government were going to attack Sri Darbar Sahib. Sant Ji knew after the Indian army attacked Sri Darbar Sahib, the Sikh panth has to have long fight against India for the freedom of Sikhs. Taking this into consideration, Sant Jarnail Singh Ji Bhindranwale gave duties and sewa to certain Singhs and told them to get out of the complex to continue fighting from outside for the freedom of Sikhs. Bhai Manbir Singh Chaheru, Baba Gurbachan Singh Manochahal, Giani Aroor Singh, Bhai Tarsem Singh Kohar, Bhai Gurdev Singh Dilwan, Bhai Gurdev Singh Usmanwala, Bhai Gurnam Singh Bandala, Baba Ranjit Singh Dyalgarh, Bhai Sukhdev Singh Sakheera were amongst the singhs ordered by Sant Ji to live the complex to start the struggle from outside the walls of Sri Darbar Sahib. The Indian army attacked the Sikh throne, Sri Harimandir Sahib. Not only Sri Darbar Sahib was attacked, the Indian army also attacked another 37 gurudwaras around Amritsar. The 1984 attack on Sri Harimandir Sahib wasn’t against Sant Jarnail Singh Ji Bhindranwale, but it was against the whole Sikh nation. Under the command of Sant Ji, warriors like General Subeg Singh, Bhai Amrik Singh, Baba Thara Singh, Bhai Subeg Singh Fauji and other handful of singhs faught against the heavily numbered Indian army and attained shaheedi. After the 1984 attack on Sri Harimandir Sahib, the scattered singhs held a meeting in the village of Pindi Balocha at Jathedar Mann Singh’s location. In this meeting singhs such as Bhai Mokham Singh, Bhai Gurnam Singh Bandala, Bhai Jagir Singh Mast, Kavisher Bhai Nirmal Singh Chola, Bhai Gurdev Singh Usmanwala, Bhai Dalip Singh Rode, Bhai Manbir Singh Chaheru, Bhai Dhanna Singh, Bhai Balbir Sigh Raipur, Jathedar Mann Singh himself along with small number of other singhs met up to discuss how to lead the Sikh Freedom Movement and also to give out duties to singhs in order to kick start the movement again. Bhai Mokham Singh was given the duty of gathering the Sikh sangat at Masaya and do lectures. Bhai Jagir Singh Mast and Bhai Nirmal Singh Chola were given the duty of preparing and singing vaars of Sikh history and Sikh warriors, to fill the Sikh sangat with courage and strength. Some singhs were given the duty of arranging weapons for the Sikh struggle. Bhai Dalip Singh Rode was given the financial duties and the duty of planning actions. Bhai Gurdev Singh Usmanwala and Bhai Manbir Singh Chaheru were given the duty to prepare the Khadku Singhs. Bhai Dhanna Singh was given the duty to collect money from the Sikh sangat of Bombay. Bhai Balbir Singh was given the duty of preparing a list of all the anti-Sikh elements. All the singhs did Ardas in front of Guru Granth Sahib Ji, which had been kept with respect in the house of Jathedar Mann Singh. These times were awkward and the responsibilities given to the singhs were very big. First the singhs decided to meet Baba Thakur Singh Ji Bhindranwale, as the movement will only move forward if the Khadku Singhs are guided by a chardikala soul of Baba Thakur Singh Ji Bhindranwale, who had been chosen as the next Jathedar of Dam Dami Taksal. When the singhs met Baba Thakur Singh Ji Bhindranwale and put forward their ideas, Baba Thakur Singh Ji Bhindranwale said, “Singho, fully belive in Sri Guru Granth Sahib and do Ardas to have Waheguru around you, guiding you”. The singhs asked to hold a smagam at Gurudwara Gurdarshan Parkash, Chownk Mehta in remembrance of the shaheeds of June 1984. Baba Thakur Singh Ji Bhindranwale told the singhs to do the smagam with full strength and also give 2100 rupees along with a Saropa to the families of shaheeds and the Dharmi Faujis. The Singhs were very happy. At this smagam Sikhs from all over India came, the singhs declared a Sarbat Khalsa to be held at Sri Darbar Sahib on 26th January 1986, where the Sri Darbar Sahib rebuilt with the blood money of Indian government will be rebuilt again but the money and sewa of the Sikh nation. The singhs invited all the Sikh sangat from the stage of this smagam to attend the Sri Darbar Sahib on 26th January 1986 for Sarbat Khalsa. The Indian government along with Tohra, Badal, Talwandi and Barnala were all against this rebuilding of Sri Harimandir Sahib with the money of Sikh nation. On 24th January 1986, the Sri Akhand Path Sahib began at Sri Darbar Sahib. Sikhs from all over the globe attended and Bibi Bimal Kaur Khalsa, wife of Shaheed Bhai Beant Singh had also come to Sri Harimandir Sahib with her Jatha. The whole Sikh sangat were very positive that only good can come out of Sarbat Khalsa, but on the other side, Surjit Barnala, who was the Chief Minister of Punjab wanted to stop Sarbat Khalsa and be seen as reliable man by the Indian government. Surjit Barnala’s son, Gagandeep Barnala alias Agandeep went to Sri Harimandir Sahib with his gang, who were equipped with rifles, but the singhs who are willing to die can’t be installed with fear and this is what Agandeep Barnala wanted. The gang of Agandeep Barnala fired bullets from outside the complex, but the singhs fearlessly went to the gang unarmed and snatched their rifles and beat the gang up with the butts of the rifles. On 26th January 1986, Sri Akhand Paath Sahib Bhog was done, now the Sarbat Khalsa lectures started, a five member Panthic Committee was established that would lead the Sikh nation to freedom. The five singhs chosen as the members of the Panthic Committee were Baba Gurbachan Singh Manochahal, Bhai Gurdev Singh Usmanwala, Giani Aroor Singh Dula, Bhai Dhanna Singh and Bhai Wassan Singh Zaffarwal. The Kar Sewa of Sri Akaal Takht had now started by the singhs. On 29th April 1986, the five singhs of Panthic Committee held a conference in one of the offices on the Parikarma of Sri Darbar Sahib and gave the world the Declaration of Khalistan. After the conference the five singhs and other top Khadku Singhs disguised themselves and escaped from the complex of Sri Darbar Sahib before the Indian security forces could get on to them. The Indian security forces sent by Surjit Barnala arrested Jathedar Gurdev Singh Kaunke and many other singhs who were doing the Kar Sewa. Under the guidance of the Panthic Committee, the freedom fighting groups were made. Small freedom fighting groups were put onto one platform and a new strong, united and organised Jathebandi was made. Panthic Committee member Giani Gurdial Singh Dula alias Giani Aroor Singh, Bhai Manjit Singh Khujala, Bhai Sukhdev Singh Sakheera, Bhai Durga Singh Arifke, Bhai Avtar Singh Bramha, Baba Ranjit Singh Dyalgarh and Bhai Gurmej Singh Dilwan joined hands and the seven freedom fighting groups were combined into one group, the Khalistan Liberation Force. Then another Jathebandi was made with the unity of Bhai Manbir Singh Chaheru, Bhai Tarsem Singh Kohar, Panthic Committee member Bhai Gurdev Singh Usmanwala, Bhai Dhanna Singh, Bhai Wassan Singh Zaffarwal, Bhai Rashpal Singh Fauji and Bhai Balbir Singh Fauji Raipur called the Khalistan Commando Force. After the arrest of Bhai Harinder Singh Kahlon who was the convener of All India Sikh Student Federation, Bhai Gurjit Singh Harihar Jhok was made the convener. 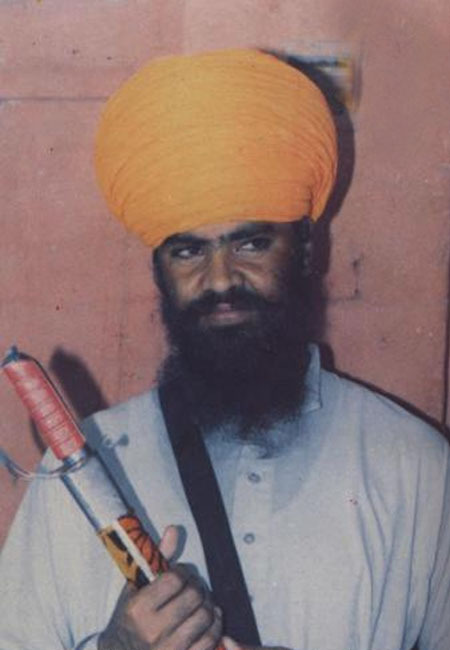 Jathedar Baba Gurbachan Singh Manochahal established the Bhindranwale Tigers Force of Khalistan, which installed fear into the hearts of the Indian security forces. Under the command of the Panthic Committee, Bhai Mathra Singh Chorha Madhra and Bhai Harjinder Singh Jinda punished many murderers of Sikhs, for example the parliament member Arjan Das, Lalit Makkan who had a hand in the killing of Sikhs in Delhi in November 1984, Indian army general Arun Kumar Vadiya who carried out the attack on Sri Darbar Sahib in June 1984. At this time the police would kill 20 singhs but another 50 singhs would join the Sikh Freedom Movement. Some of the close singhs to Bhai Sahib were, Bhai Manbir Singh Chaheru, General Labh Singh, Bhai Gurjant Singh Rajasthani, Bhai Subeg Singh Lubhania Wali, Bhai Gurjit Singh Harihar Jhok, Bhai Gurnam Singh Bandala, Bhai Rashpal Singh Fauji, Bhai Balbir Singh Fauji, Bapu Malkit Singh Rajasthani, Bhai Kuldeep Singh Ladoo, Bhai Gurcharan Singh Vadian, Bhai Dhanna Singh, Bhai Sukhdev Singh Jhamke, Bhai Wassan Singh Zaffarwal, Baba Gurbachan Singh Manochahal, Dr Jagdish Singh Bhuttar, Jathedar Mann Singh Pindi Balocha, Jathedar Durga Singh Arifke, Bhai Rasal Singh Arifke, Bhai Kulwant Singh Arifke and many more Sikh warriors punished anti-Sikh elements together. Bhai Sahib would continuously recited Gurbani, he also had great combat skills, Bhai Sahib wouldn’t stay in one place for too long and encouraged fellow singhs to live the life of Sikh values. Once Bhai Sahib went underground in 1984, the Punjab police regularly started harassing the family. When the police would ask Bhai Sahib’s mother and wife about Bhai Sahib, they would say, “He left home to go and do sewa at Chownk Mehta, Dam Dami Taksal. We have not seen him since”. The police pulled to roof off the family house and also did not allow the family to work in their own farms, which resulted in the bad condition of the farms. The family spent most of their days away from their home. Now the family would arrest Bhai Sahib’s relatives and threaten them to produce Bhai Sahib. These relatives of Bhai Sahib left Punjab to avoid the police harassment and moved to Rajasthan. One day as Bhai Sahib travelled on bus from Nakodar to Jalandhar, the Nakodar police arrested Bhai Sahib. When the police asked for name, Bhai Sahib gave another name from his own, but the police got a panthic traitor from Usmanwala and a member of Congress came to the Nakodar police station to identify Bhai Sahib. Now Bhai Sahib was taken to the interrogation centre of Jalandhar and the brutal torture of the Punjab police was done on Bhai Sahib. Four SSP’s of the district came to see Bhai Sahib at the interrogation centre in Jalandhar, along the DGP of Punjab, Julio Francis Rebeiro. With hot irons the men of Punjab police burnt the chest of Bhai Sahib and the nails from fingers and toes were pulled out with pliers. The police were trying to make Bhai Sahib to get the Panthic Committee member, Sri Akaal Takht Sahib and Bhindranwale Tigers Force general, Baba Gurbachan Singh Manochahal, General Labh Singh Panjwar, Bhai Dalvinder Singh, Baba Chup Ugrewal, Bhai Gurnam Singh Bandala, Bhai Kanwarjit Singh Sultanwind, Bhai Sukhdev Singh Jhamke, the convener of Sikh Student Federation Bhai Gurjit Singh Harihar Jhok to take back the Declaration of Khalistan and tell the Sikh nation that Panthic Committee was linked to Pakistan and that the Panthic Committee are willing to work alongside the Indian government for the rights of the Sikhs. Julio Francis Rebeiro told Bhai Sahib, “Leave the Sikh Freedom Struggle and join us. We will help you with everything”. Bhai Sahib read the full Salok of Jap Ji Sahib and fell unconscious and later attained shaheedi like the puratan singhs of the Sikh history. Shaheed Bhai Gurdev Singh Usmanwala did not bow down to the blind torture of the Indian government. After attaining shaheedi, Bhai Sahib joined the Shaheed singhs of the Sikh panth. Bhai Gurnam Singh Bandala tells us, if Bhai Sahib had bowed to the Indian brutal torture then, Baba Gurbachan Singh Manochahal, General Labh Singh Panjwar, Bhai Dalvinder Singh, Baba Chup Ugrewal, Bhai Kanwarjit Singh Sultanwind, Bhai Gurjit Singh Harihar Jhok, Bhai Sukhdev Singh Jhamke and many more Khadku Singhs would have been captured. Bhai Sahib did not only prove the words of Sant Jarnail Singh Ji Bhindranwale, but also lived according to the Gurbani by having his limbs cut off but still remaining in chardikala. Whenever we talk about the shaheeds of Dam Dami Taksal, the photo of Shaheed Bhai Gurdev Singh Usmanwala come in front of us. On 6th October 1987 the headlines on the radio were, the Panthic Committee member, the very dangerous Bhai Gurdev Singh of village Usmanwala, has been killed in police encounter in the village of Mehmowal, district Jalandhar. He was wanted for many murders. Ajit Jalandhar newspaper of 8th October 1987, Bhai Gurdev Singh Usmanwala killed in police encounter along with other 10 singhs from different parts of Punjab. Julio Francis Rebeiro stated in a press conference in Chandigarh, that Bhai Gurdev Singh Usmanwala was one of the five real members of the Panthic Committee who had introduced the Declaration of Khalistan to the Sikh nation and there was reward of 1 lakh rupees for his capture. At the location where Bhai Gurdev Singh Usmanwala was killed the police found a 9mm pistol, 2 full mags, 6 empty mags and a hand grenade. Later the journalist of Ajit newspaper, went to the location of the encounter and said that there is no truth in the encounter report. The Sikhs of Punjab knew this was a fake encounter and put pressure on the government to get to the bottom of this encounter and charge the people responsible for the unlawful killing of Bhai Gurdev Singh Usmanwala. The news of Bhai Sahib’s shaheedi reached Usmanwala on 7th October 1987. Bhai Mahal Singh, who was the sarpanch of Usmanwala and Bhai Balwinder Singh, who was the brother-in-law of Bhai Sahib went to the Mallanwala police station, district Ferozpur to get information of Bhai Sahib’s location. After speaking to SHO, the singhs were sent to Shahkot police station, district Jalandhar. Here the singhs were told that Inspector Gurbachan is dealing with the case and only he can answer their questions. Both singhs then met Inspector Gurbachan and asked for the body of Bhai Sahib. The SHO and Inspector Gurbachan the photo of Bhai Sahib’s dead body and asked if this was Bhai Sahib. Upon looking at the photo, the singhs could not recognise Bhai Sahib and then Inspector Gurbachan made some calls and told the singhs to the cemetery outside the city and there are three cremations happening, ask the caretaker for the ashes of Bhai Sahib and he will give it you. Finally Sikh managed to get the ashes of Bhai Sahib. Shaheed Bhai Gurdev Singh Usmanwala was great warrior and the brains of the movement. The Sikh Nation will always bow to the life and the shaheedi of Bhai Sahib and also the sacrifices of Bhai Sahib’s family.